The other day, the thermometer at the Furnace Creek Visitor Center in Death Valley reached 125° F (51.67 C). That’s not unheard of this time of year; the average high temperature for July in Death Valley is 116° F. In the summer of 2001, there were 154 consecutive days in which the temperature exceeded 100 degrees. About a century ago, it got up to 134° F (56.7 C) on July 10, 1913, setting the mark for highest temperature ever recorded on the planet. Bear in mind that those numbers are air temperature. The highest ground temperature recorded at Death Valley was on July 15, 1972 — it was 201° Fahrenheit. In those conditions, wearing shoes is recommended. So, you might reasonably ask, why go to Death Valley? Well, for one thing, since it is located along the California/Nevada border, tour buses stop there on the way between Las Vegas and San Francisco. But a better reason to visit is that Death Valley is starkly beautiful. In addition to being the hottest place in North America (which, I’ll admit, had no appeal for me) it is also the driest — only a couple of inches of rain per year — and the lowest. These attributes, if you can call them that, have combined to create sights you’re unlikely to see anywhere else. There’s a spot called Badwater Basin, named for a small, spring-fed pool of brine and the vast salt flats that surround it. As you get out of your car at Badwater Basin, take a look up the mountains across from the parking lot. Wayyyy up there is a sign that indicates sea level — it’s 282 feet above where you are standing. A few miles from Badwater is a spot called Artists Palette — slopes of pigmented earth and oxidized minerals in colors one wouldn’t normally expect to find on hillsides. Especially in late afternoon, there are vivid blotches of blue, green, yellow, orange and even purple. The eroded hills at Zabriskie Point are a deep yellow; in fact, when we photographed them at sunset they were almost gold. At sunrise, the mountains in the distance reflect the light in shades of pink and blue. We were there in March, by the way, when we actually needed jackets in the early morning hours. 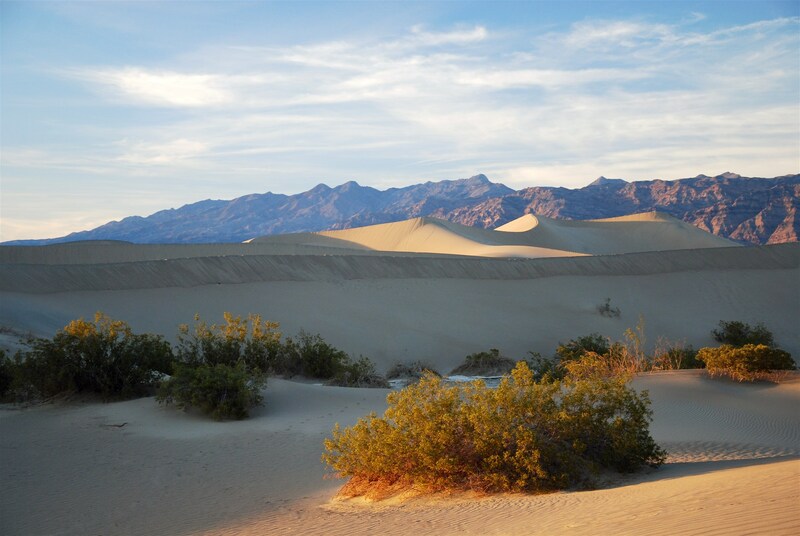 My favorite area in Death Valley National Park is Mesquite Flat Sand Dunes. The dunes cast deep shadows at sunset (see photo). Signs of life were evident here, including shrubs and the tracks of small rodents and sidewinder rattlesnakes. A man-made attraction in Death Valley is Scotty’s Castle, a mansion built in the 1920s. Scotty was a con man who claimed to have found gold in the area and persuaded investors to part with their actual money for a chance at speculative riches. A wealthy man named Johnson owned the castle, but for some reason, Scotty’s name got attached to it, and he is buried on a hill overlooking the castle. Scotty’s passing had nothing to do with how Death Valley got its name. That is associated with a group of “49ers”, prospectors who hoped to strike it rich during the California Gold Rush. They took what they thought would be a shortcut and wound up getting lost in this bleak region. Many months passed before they found their way out. It’s remarkable that only one man died during that time, but the name Death Valley stuck. There were hundreds (perhaps thousands) more locked to the Brooklyn Bridge on this particular day. It’s either a symbol of romantic commitment, or it’s an act of vandalism. Those are basically the two opinions about “love locks”, which can be seen in profusion at many tourist destinations around the world. They are padlocks, like you might have on a tool shed or gym locker, that have been embellished with the names or initials of couples in love. This can be done with nail polish or paint or a Sharpie. In some cases, the names and sentiment — “Cynthia and Mike Forever”, let’s say — are etched by laser. The next step is for the couple to attach this chunk of sentimental hardware to a public fence or building or especially, a bridge. After looking meaningfully into each others’ eyes, they then fling the key into the river, signifying that their love is bonded together forever. Love padlocks, as they are also known, seem to date back a hundred years or so, to a Serbian couple. He was a soldier about to be sent off to war; she was a young schoolteacher. OK, this isn’t going where you think it is — he fell in love with a Greek woman and never saw the schoolteacher again. The legend is that young Serbian girls put love padlocks on a particular bridge in hopes of avoiding a similar fate. The practice wasn’t widespread in the 20th century, but got a huge boost in 2006 from a best-selling Italian novel called Ho Voglia Di Te (I Want You). In the book and subsequent movie, the main characters put a padlock on Ponte Milvio, a bridge over the Tiber in Rome. Love locks became a craze in Italy: The Rialto Bridge in Venice sprouted them, and in Verona there are locks all over the house where Juliet supposedly lived when she was falling for Romeo. On the Ponte Milvio, a lamppost buckled under the weight of love locks. Tourists spread the newly established tradition around the world, everywhere from Brisbane, Australia to Seoul, South Korea they are affixed to public property, mostly by visitors. Many locals take the dim view of love locks as being clutter, or worse — dangerous. The Pont des Arts in Paris started to sag and has had grill work collapse regularly from 93 metric tons (over 205,000 pounds) of love locks. That bridge seems to be a favored spot for lovers, but throughout the city, bridges over the Seine have an estimated 700,000 padlocks attached. That’s the sort of thing that generates the conflict between keeping love alive and keeping infrastructure intact. 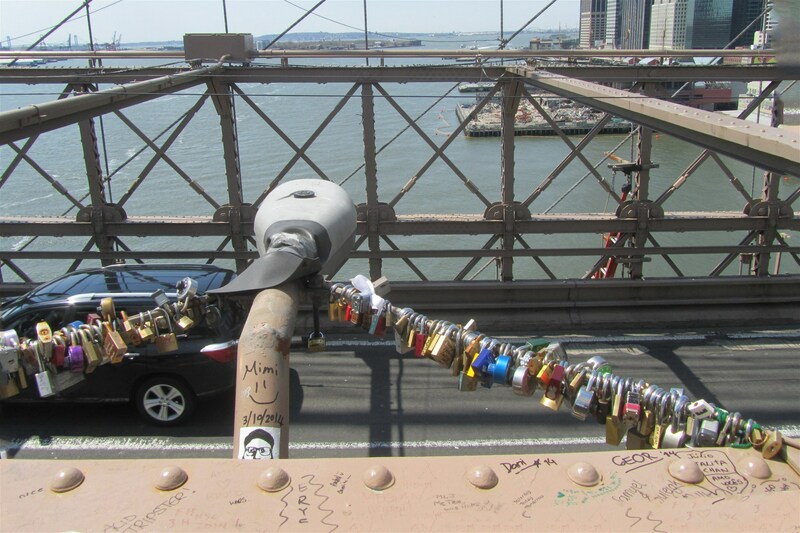 On New York’s Brooklyn Bridge, a key tossed by lovers might be just as likely to hit a car passing below as it would to reach the river (see photo), and locks add significant weight to the bridge’s cables. Workers from the city’s Department of Transportation periodically remove the locks with bolt cutters and recycle them. That approach has been taken in most other cities as well. No one actually wore that, since the custom of printing slogans on clothing didn’t exist in the 18th century. Besides, for the individuals who went on the Grand Tour, coming home with reasonably priced mementos would be considered disgraceful. After completing their formal education, young aristocrats went off to see the sights of the European continent, a journey that could last from several months to several years. The general goals of the Grand Tour were to get a closeup look at the cultural treasures of western civilization, improve language skills, make contact with fashionable society in other countries, and spend a big chunk of one’s inheritance. Grand Tourists eventually went home with trunks full of books, ancient coins, furniture and artwork. Among the most prized souvenirs of the Grand Tour were paintings of Venice by an artist known as Canaletto. His real name was Giovanni Antonio Canal, which is fitting for a man born and raised in Venice, a city famous for its canals. You might say Canaletto painted portraits of places: the Doge’s Palace, St. Mark’s, the Rialto and other landmarks of Venice. 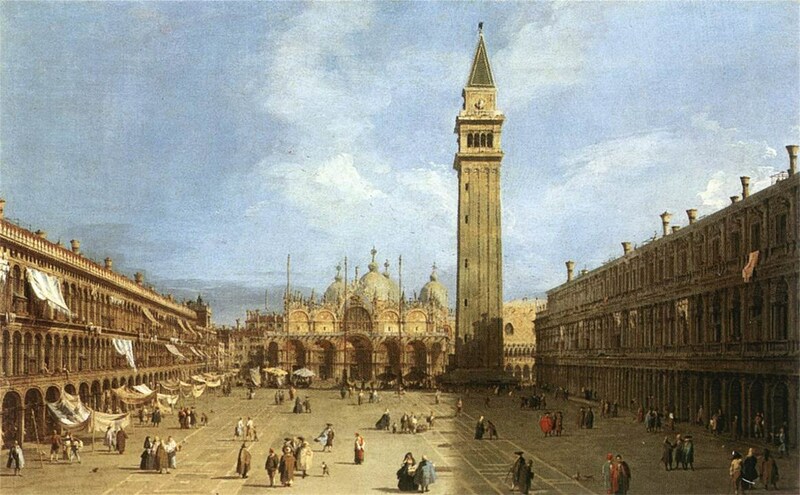 Canaletto may have had to adjust his prices downward in 1740, because the Grand Tourists abruptly stopped coming. Something called the War of the Austrian Succession had most European countries fighting on one side or the other. The rich guys thought it prudent to confine their touring to the manicured grounds of their own estates. By 1746, Canaletto succumbed to a suggestion by a British consular official that, since the buyers weren’t coming to Venice, he should go to them. Canaletto stayed in England for ten years, cranking out paintings of bridges and buildings and grand houses. In general, these works aren’t as admired as his Venetian views, partly because an artist whose strength is painting the effects of sunlight might be hampered by the comparative absence of sunlight in England. Upon his return to Venice Canaletto continued painting his favorite subject until his death in 1768. By then he had inspired other artists to adopt his style, notably Francesco Guardi, who presumably made a nice living when the Grand Tourists returned. Canaletto sold well over 500 paintings in his lifetime. King George III of England bought a bunch of them in 1762; the Royal Collection has over 50 paintings and 140 drawings, making it the greatest collection of Canalettos in the world. My travel souvenirs do not include any Canalettos, but I do have a pretty nice collection of coffee mugs from airport gift shops. 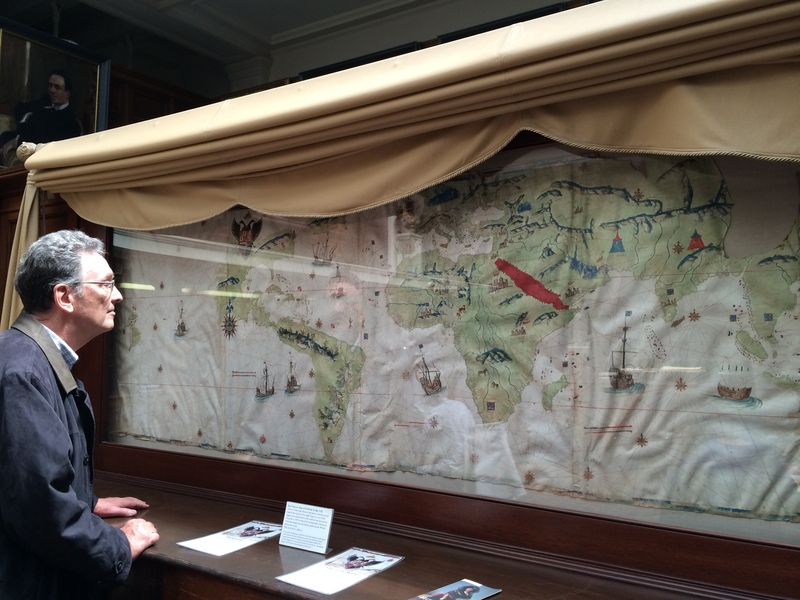 What treasures have you brought home from your “Grand Tour”? Several of our friends are going through the process of “downsizing”. Over the years, we all accumulate stuff that, through sentimentality or laziness, we have a hard time throwing away. Hey, there’s always a chance that I’ll need some of those telephone cords that are in a box in my garage. To give you an idea of how our belongings expand over time, consider this: According to the website of The Self-Storage Association, “The self-storage industry in the United States generated more than $22 billion in annual U.S. revenues (2012).” Of course, if it’s in a storage unit, that suggests that the stuff is overflow from the house or apartment where it had previously been clutter. Putting it in a storage unit is one solution. The downsizers take a different approach, getting rid of unneeded things so they can live in a smaller space. A third option is to move to a bigger place and fill it up with grandma’s sweaters, the tire chains for the car you no longer own, and all the other goodies we can’t bear to part with. OR — you could start your own museum. As they sifted through the objects with which they were sharing space, some of my downsizer friends have discovered that they owned collections they didn’t realize they had. Sally and I had probably given them some of the drink coasters that somehow wound up in the back of a drawer and now number in the hundreds. What they do with them now is their business — yard sale, charity donation — I’m just saying, they have enough to open a Museum of Coasters. 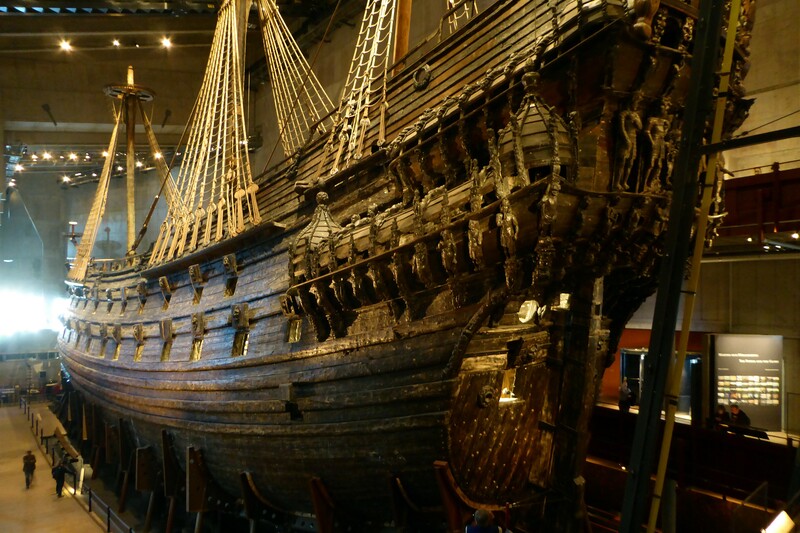 That may sound a little far-fetched, but you might be surprised at some of the unusual museums around the world. In Rüdesheim, Germany, Sally and I visited Siegfried’s Self-Playing Music Museum. It was a collection of music boxes and elaborate cabinets that held violins and piano keyboards and, so help me, even banjos. When the machinery was set in motion by something that looked like a player-piano roll, the instruments would bang out a tune. If you find yourself in Gatlinburg, Tennessee, you won’t want to miss the Salt and Pepper Shaker Museum, which has thousands on display. A man named Gary Doss turned his extensive collection into the Burlingame Museum of Pez Memorabilia. It’s just a short drive from San Francisco International Airport. Among other things, there are hundreds of Pez dispensers, including the world’s largest — it’s almost 8 feet tall. 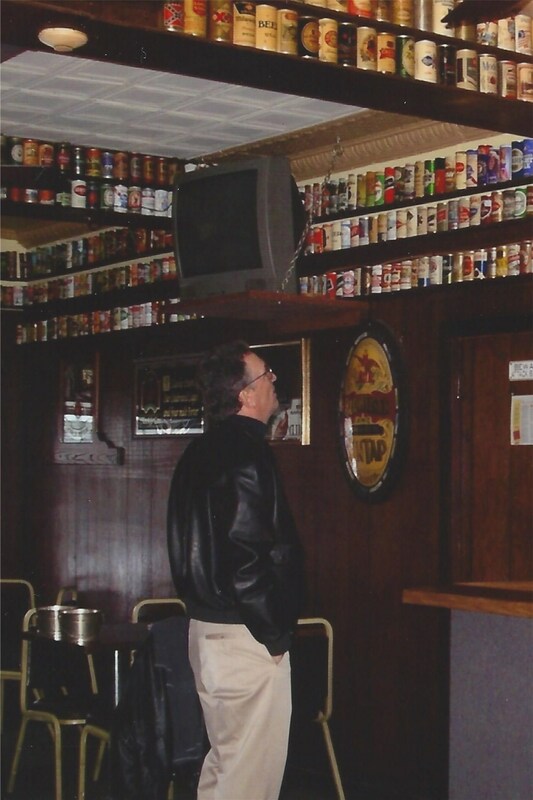 Ye Ol’ Watering Hole & Beer Can Museum in Northampton, Massachusetts, has over 4,000 beer cans — none are duplicates. Several years ago I bought an official T-shirt there; it’s now part of my growing collection of souvenir T-shirts. In Madrid, Spain, we briefly stopped in at Museo del Jamon (Museum of Ham). Frankly, it’s more of a restaurant than it is an actual museum. Besides, if you’re considering my proposal to start your own museum, you probably don’t have a lot of old hams stashed around your house. It’s also possible that you don’t want a lot of strangers tramping through your home, gawking at your extensive collection of refrigerator magnets or trowels or whatever. If you’re adamant about not opening a museum, maybe you want to think about selling your stuff online. Then, with the money you make, you can buy more stuff! 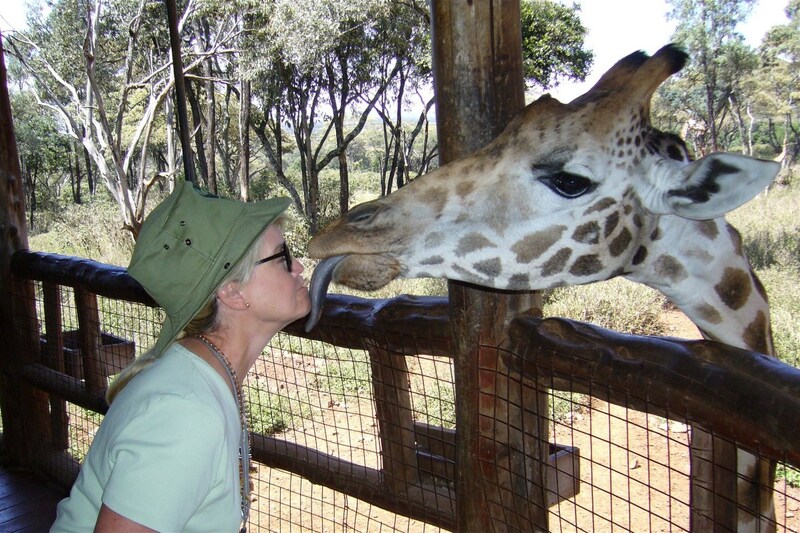 This resident of Nairobi was almost too friendly. In what must have been a blow to Pakistan’s tourism industry, Condé Nast Traveler magazine named Islamabad the world’s second least-friendly city. Perhaps Islamabad can take some consolation in the fact that at least they are not Newark, New Jersey, which, according to the magazine’s poll of readers, is the World’s Unfriendliest. This was not a rigorously scientific study, so it seems likely that many of the readers who scorned Newark may have only visited its airport, while on their way to New York City. (Somewhat surprisingly, NYC did not make the list.) Airports are not generally known to be jolly and welcoming anywhere on earth. Another assumption that can reasonably be made about the survey is that most of the 47,000 voters were Americans, since U.S. cities dominated the list. Five of the top ten and eight of the top 20 unfriendly cities are within the continental United States. They include Oakland, California (#3), New Haven, Connecticut (#7), Detroit (#8), Atlantic City, New Jersey (#9), Los Angeles (#12), Albany, New York (#13) and Wilmington, Delaware (#17). You see why I think most of the voters were taking revenge on their neighbors? How many tourists from abroad say, “Hey, let’s go to America and visit Albany!”? I’ve visited several of the cities on the list — lived in one of them — and I don’t see how it can objectively be determined that Los Angeles is a more hostile locale than, say, Riyadh, Saudi Arabia (#15) or Casablanca, Morocco (#18). As I’ve mentioned before, Paris is one of my favorite places, but I know other people who associate it with rudeness. Paris didn’t make the list, by the way; with the exception of Moscow (#16), no European city did. Maybe the language differences don’t seem as daunting in Italy or Ireland as they do in Guangzhou, China (#11). The fuzzy criteria for what make a city seem unfriendly got me thinking about places we’ve been. There have been moments of unpleasantness in Barcelona and Shanghai and Nairobi, but isolated incidents don’t necessarily make them unfriendly cities. Rudeness or hostility can pop up anywhere. In fact, it occurred to me that the most unfriendly travel experience I ever had happened in the city where I live. Our day had started in Switzerland and had included a four-hour layover at London Heathrow. By the time we got home we were exhausted, but needed food so we wouldn’t wake up hungry at 3 a.m. Since I had been salsa-deprived while in Europe, I drove to a little Mexican food café to get some stuff to take home. After a couple more verbal challenges, I felt the wind of a fist flying past my head. It landed on the guy nearest me, who responded in kind. Other customers jumped in to try to pry apart the combatants, and the whole tangle of them slammed into the salsa bar. I didn’t see how a sleep-deprived middle-aged man could bring about reconciliation, so I walked out the door. Fortunately, there weren’t any Traveler magazine voters around to witness this unfriendly exhibition, or my town might have made the list, and we’re actually pretty friendly. Most of the time.